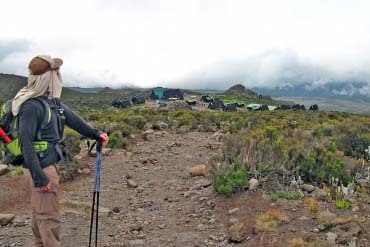 The Marangu route offers a well-developed and gradual trail to the summit of Mount Kilimanjaro. It is considered to be the more comfortable and easiest route, as your climb is moderate and constant with only the final leg to the summit slightly more challenging. Overnights will be spent in simple mountain huts. At Kilimanjaro Airport, you will be greeted by our transfer driver and taken to the Meru View Lodge in Usa River, close to Arusha. The rest of the day is for you to do as you please. You can opt to spend the day relaxing by the lodge pool or explore the town of Arusha (short taxi drive away). In the late afternoon you will be briefed by our team on what to expect on your upcoming trek. The night will be spent at Meru View Lodge. After breakfast you will be taken to the Kilimanjaro National Park gate at 1,840 m. Upon completion of the necessary paper work, your trek commences and soon you will be hiking through the dense rainforest of Marangu. Looking up, you might have the opportunity to catch a glimpse of the thumbless black and white colobus monkeys. After you have reached the Mandara Hut (2,700 m) in approximately 4 hours and had some time to catch your breath, you can join a walk to the Maundi Crater. Enjoy wonderful views towards Kenya and over the gleaming lakes which share the border between Kenya and Tanzania. 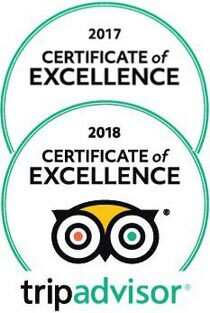 You will stay the night at Mandara Hut. An early breakfast gets you ready for the trek ahead and shortly after leaving Mandara Hut you will reach the cross roads between Horombo Hut and Maundi Crater. Heading in the direction of Horombo Hut the vegetation will change to shrubs and you will cross the open moor land reaching your destination in approximately 4 to 6 hours. 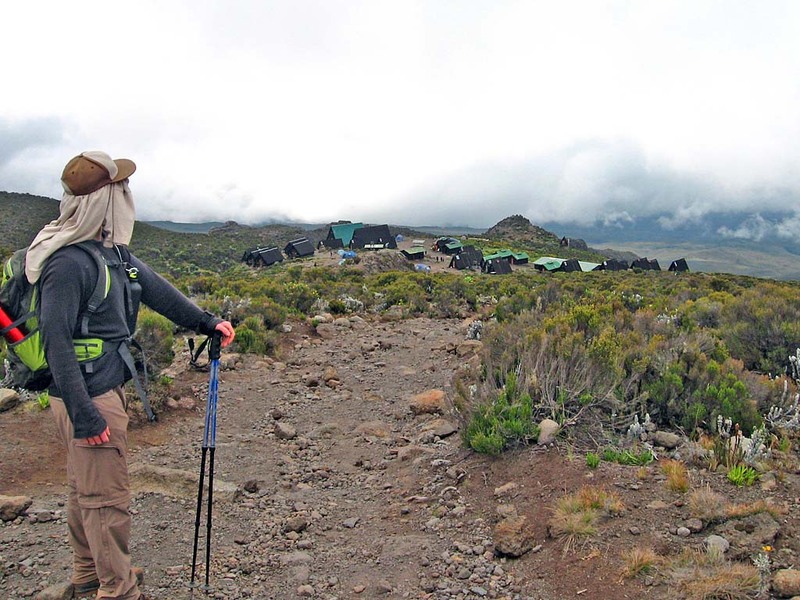 Looking back your path will already be shrouded in clouds and looking forward you will catch glimpses of Mawenzi, Kibo peak and the Masai steppe. After your evening meal you will drift off to sleep at the Horombo Hut. Zebra Rocks is on the agenda today, in order for your body to acclimatise to the altitude. 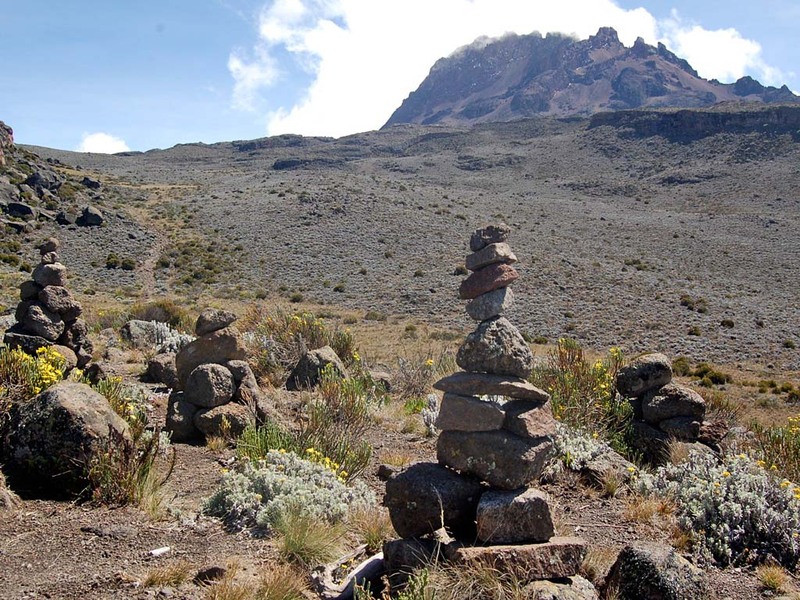 Acclimatisation plays an important role in improving your chances to reach the summit and this 2 to 4 hour trek offers you the opportunity to stretch your legs and breathe in the fresh air. Zebra Rocks (3,980 m) is named after the distinct black and white stripes covering the rock formation. A hot lunch will await you on your return and the rest of the afternoon is for you to enjoy the spectacular views around you and regain your strength for tomorrow’s hike. You will stay another night at Horombo Hut. After breakfast a long and tough journey to Kibo Hut awaits you. 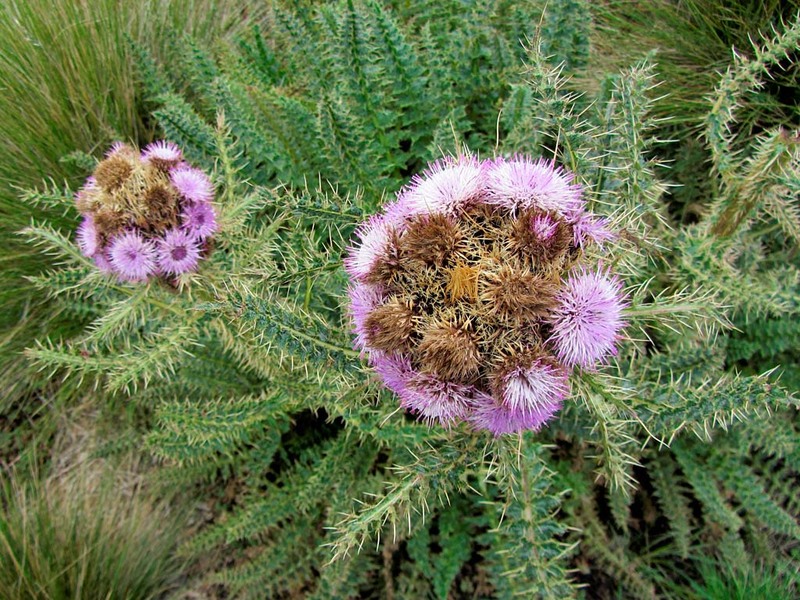 The vegetation slowly changes into alpine desert and you will pass the “last waterpoint” on your way to the so-called “saddle”, a plateau situated between the peaks of Mawenzi and Kibo. You will arrive at the Kibo Hut in about 5 to 6 hours and go to bed straight after dinner as the summit calls for an early start, at approximately 11pm. The summit day has finally arrived and at around midnight, when the lava ash is still frozen, you will start your ascent. Your path will be strenuous with only your headlights leading the way. You will pass the Hans Meyer Cave at 5,200 m and slowly make your way up. Gilman’s Point at 5,715 m will be reached as the sun rises over the crater rim. 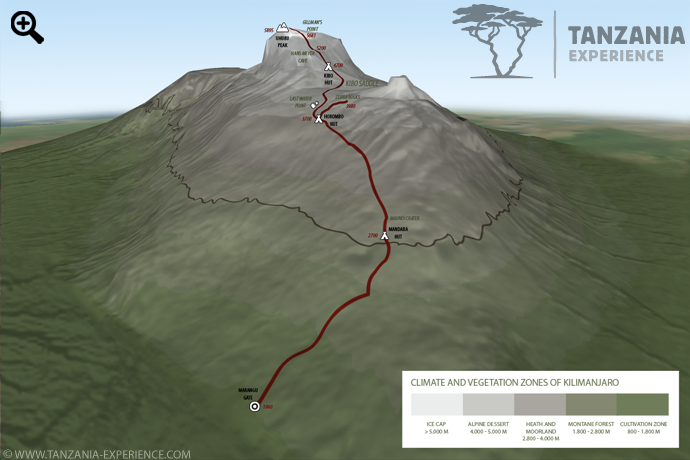 You will continue another 1 to 2 hours to Uhuru Peak (5,895 m). The cold is soon forgotten as you stand on the “Roof of Africa”, basking in the sun. After a well-deserved photo opportunity you will descend along the same path. The lava ash will now have thawed, allowing for a faster descent. 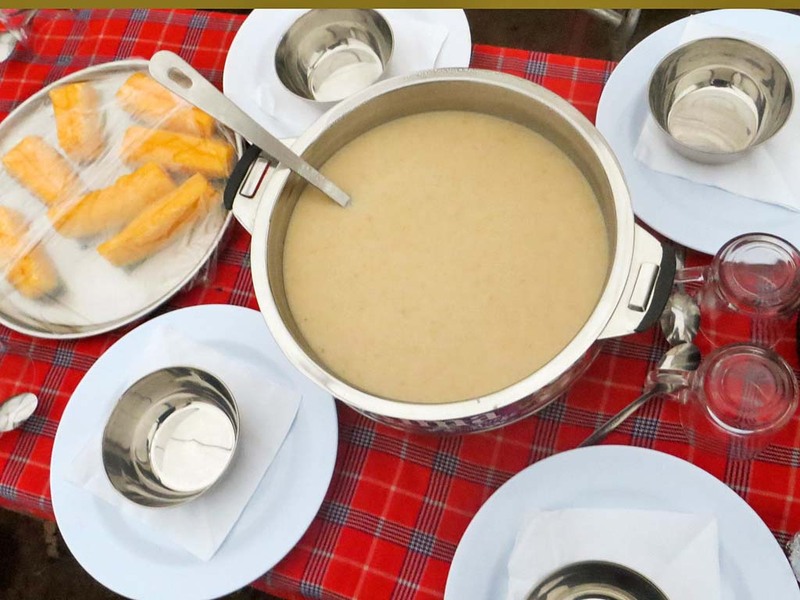 Upon your arrival at Kibo Hut, a warm meal and approximate 2 hours rest awaits you, before you continue down to the Horombo Hut, where you will stay the night. The surrounding vegetation becomes greener as you continue your descent and soon you will arrive at the Mandara Hut (2,700 m), where a hot lunch awaits you. The journey back to the park gate gives you another chance to observe the beautiful tropical rainforest and spot anything you have missed on the way up, like the Impatiens kilimanjari flower, which is endemic to the rainforest on the slopes of Mt Kilimanjaro. Arriving at the gate you will say goodbye to your mountain crew and be taken back to the Meru View Lodge. At the lodge you can enjoy a shower and celebrate your success in reaching the summit of Mt Kilimanjaro. Dinner and overnight at Meru View Lodge. After breakfast, you will either be transferred to Kilimanjaro Airport. Alternatively, you can extend your trip and go on safari tour or relax by the Indian Ocean. According to the national park authorities, children under the age of 10 years are only allowed to hike until Horombo Hut (3700 m). There are no official restrictions for children above the age of 10 years but because the chances of children succumbing to mountain sickness are a lot higher than they are with adults, we recommend a minimum age of 14-16 years. Please note that children of all ages have to be accompanied by one of their parents at all times. Although there is no maximum age restriction, a medical check-up is advisable for climbers above the age of 60. The Marangu Route is often considered as the easiest route to the summit. Compared to other routes, the ascent is more gradual and although both the ascent and descent follow the same route, you will be rewarded with excellent panoramic views throughout your trek (weather permitting). You will overnight in basic mountain huts. What about the ablution facilities? While breakfast and dinner are served in a communal dining hut, lunch is enjoyed en-route.